After three years of struggling against large dams and heavy industry, the Saving Iceland campaign will connect with struggles around the globe. The Saving Iceland Conference will be featuring speakers from South and North America, Africa, India and Europe, activists and scientists. Saving Iceland’s magazine Voice of the Wilderness (download pdf) introduces all the key issues and speakers, including for example Dr. Eric Duchemin (University of Montreal, consultant for the IPCC), Gudbergur Bergsson (writer), Cirineu da Rocha (Dam-Affected People’s Movement, Brazil) and many others, and the conference program. Around the world, heavy industry and large dams have displaced millions of people, mostly without any compensation. They have destroyed terrestrial and acquatic ecosystems, erased wildlife. They have polluted our air and water and are changing our climate beyond repair – in the name of progress. Former Indian prime minister Jawaharlal Nehru put it this way: “If you are to suffer, you should suffer in the interest of the country”, speaking to villagers who were to be displaced by the Hirakud Dam, 1948. Both the governments of India and Iceland still regard megahydro as a symbol of ingenuity, progress and a matter of national pride. In Trinidad and Tobago, and in Iceland, the aluminium industry is looking for abundant sources of power, in a time of increasing energy insecurity. But history has always shown undercurrents who would not conform to the prevailing views of progress. Many people resist being sacrificed for the sake of the country or the economy and many have resisted their land and wilderness being sacrificed. 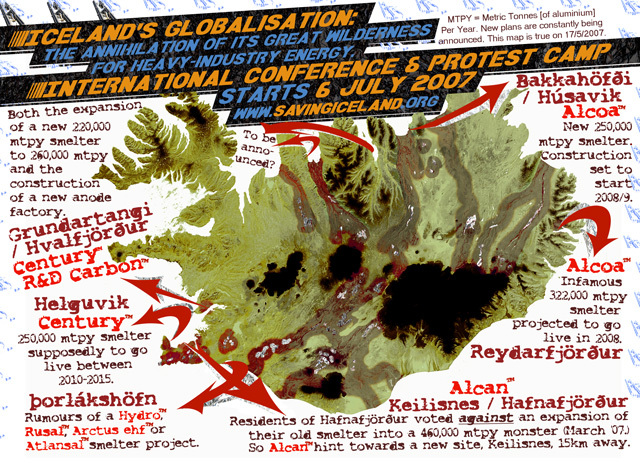 The Saving Iceland 2007 Conference will broaden your perspective on the struggle against heavy industry. Presiding the conference is the well known American preacher, humorist and social activist, Reverend Billy of the Church of Stop Shopping. Changeallujah! “The protection of the Icelandic wilderness is very much connected to global issues such as climate and energy,” says Jaap Krater from the Netherlands, a member of Saving Iceland’s conference organizing collective. Admission to the conference will be free, donations welcomed. There will be a creche available and free camping. There will be organic, vegetarian food available at cost price from a new Icelandic mobile action kitchen collective. Breakfast, coffee and tea will be served in the morning on the Saving Iceland campsite. Introduction to how Iceland is threatened by heavy industry. People’s struggle against a new ALCAO and AluTrint smelter in Trinidad & Tobago. From the past to the future – how direct action can change the course of history. Most well-known people’s movement in India, fighting for adivasi (tribal) rights displaced by megadams. Heavy industry developing strategies for the climate and energy crises. A presentation on the output of greenhouse gases of hydroelectric reservoirs. A green or grey future? Differing visions of progress. Discussion from the grassroots for the struggle against heavy industry in Iceland. The fight against UTKAL/ALCAN in East India. Experiences of the fight against ALCAN in South Africa. Abuse of power as a rural fishing community is turned into a corporate heavy industry zone. Aluminium threatening the Amazon basin and it’s people. What will it take for us to stop the horrors that characterize our way of being? Video-conference with green anarchist author Derrick Jensen in the US. Sharing experiences of people’s movements against heavy industry, large dams, the anti-roads movement and globalisation. Discussion of how to bring the global movement for ecolocical harmony and justice and against overdevelopment forward. International panel featuring members of the 2007 mobilisation against the G8, Road Alert UK, anti-aluminium activists from around the globe, and audience discussion. At the conference, there will be speakers from Icelandic Naturewatch, the Icelandic Society for the Protection of Birds, Futureland, Saving Iceland and local Icelandic grassroots groups. In addition, the following international speakers will be attending the Saving Iceland Conference. – Cirineu da Rocha for the Dam-Affected People’s Movement from the Amazon basin in Brazil, where ALCOA wants to build a number of dams. – Dr. Eric Duchemin, adjunct professor at the University of Québec at Montréal Canada and research director of DREXenvironnement, has been a leading author for the UN’s Intergovernmental Panel on Climate Change (IPCC) and will be talking on the effect of large dams on climate. – Lerato Maria Maregele is involved in the struggle to stop a new ALCAN smelter in South Africa. – Kailash Awasya, involved with the Save the Narmada Movement (Narmada Bachao Andolan), the most well known South-Asian social movement, fighting against large dams and for tribal rights in India’s Narmada River Valley and beyond. – Helen B will join us from the UK. She has been heavily involved with the succesful British anti-roads movement. She will give an overview of the fascinating history of direct action. – Attilah Springer, Rights Action Group, is fighting a new ALCOA smelter in Trinidad & Tobago. – Till Seidensticker has been involved and will be talking about the recent mobilization against the the G8 in Germany. – Jaap Krater, is involved in GroenFront! – Dutch Earth First!, a high-profile direct action movement in the Netherlands. He will be talking on the response of the aluminium industry to peak oil, the looming energy crisis and climate change. The struggle here in Trinidad and Tobago continues. The ALCOA smelter has supposedly been shelved by the government for now but we believe it is only a matter of time before it comes back on stream. Our efforts are now concentrated against the construction of Alutrint’s smelter. The work you are doing is necessary and appreciated in this fight against global greed, injustice, warmongering and environmental degradation. … a visiting associate professor in the sociology and anthropology department at Swarthmore College.